Sunflower meal is the by-product of the extraction of oil from sunflower seeds. In terms of production, it is the 4th most important oil meal after soybean meal, rapeseed meal and cottonseed meal (Oil World, 2011). A wide variety of products are available on the market, from low-quality straw-like meals to high-quality flours. Sunflower meals can be made from whole or decorticated seeds, and can be mechanically and/or solvent-extracted. The quality of sunflower meal depends on the plant characteristics (seed composition, hulls/kernel ratio, dehulling potential, growth and storage conditions) and on the processing (dehulling, mechanical and/or solvent extraction) (Golob et al., 2002; NRC, 1973). While solvent-extracted sunflower meal remains the main type of sunflower meal commercially available, oil-rich sunflower meals obtained by mechanical pressure only have become more popular since the 2000s, with the development of organic farming and on-farm oil production. Sunflower meal is available worldwide. World production was 13.5 million t in 2010-2011 (Oil World, 2011). The European Union (EU-27) is the main producer and importer: it produced 3.3 million tons and used 5.7 million t in 2009-2010. Other main producers and exporters were Ukraine (2.5 million t), Russia (2.3 million t) and Argentina (1.21 million t). Turkey, Israel and Egypt are the main importers after EU (FAS, 2011). Sunflower seeds from oil types contain about 20-30% hulls, which are often removed before oil extraction. This is because of their deleterious effects on oil presses: they hinder lower oil extraction and reduce the quality of both oil and meal (Kartika, 2005). Reducing the hull content by 1% improves pressing capacity by 2.5%. A well-managed dehulling process yields seeds with 8-12% hulls remaining on the kernels (Campbell, 1983). Dehulling is done after cleaning the seeds and drying them down to 5% moisture, which facilitates kernel-hull separation (Kartika, 2005). The usual process consists in cracking the seeds by the mechanical action of centrifugal or pneumatic shellers. It can also be done by abrasion (Carré, 2009). The resulting blend is winnowed to separate the hulls from the kernels. Some sunflower varieties have thinner hulls that are more difficult to remove. In this case, dehulling is not recommended as it may result in oil loss, and increases extraction costs without enhancing oil and sunflower meal quality (Grompone, 2005; Campbell, 1983). Once winnowed, the kernels undergo mechanical pressing through screw-presses (expellers), resulting in a "cake" containing 15-20% of oil. This cake can subsequently be extracted with a solvent (usually hexane) to yield more oil. While pressing followed by solvent extraction is the most common industrial process, mechanical extraction is used by producers of specialty oils and smallholder farmers in both developed and developing countries (for example in Zimbabwe; Mandibaya et al., 1999). In the European Union, regulations forbid the use of solvents for the production of feed ingredients used in organic farming (European Commission, 2007), so only mechanically-extracted sunflower meals can be used for organic animal production. Fresh sunflower meal must be dried for optimal storage. It can be ground, broken into small pieces or pelletized, for easier handling and storage by adding a suitable binder such as molasses or fats under high pressure in an pelletizer or extruder (Grompone, 2005). Solvent extraction results in a lower fat content, while dehulling decreases the fibre content, yielding a meal richer in protein. There are fully decorticated meals (high protein, low fibre), partially decorticated meals and non-decorticated meals (low protein, high fibre) with no clear separation between these grades. Like other protein feeds such as fish meal or soybean meal, sunflower meal is usually graded and sold on the basis of its protein content, for example "28", "29", "37", etc. In the USA, protein level and process of manufacture must be mentioned in order to inform users about the quality of the sunflower meal (NCPA, 2008). The colour of sunflower meal ranges from grey to black depending on the degree of dehulling (meals with less hulls are lighter) and on the extraction process (Naidu, 2008). 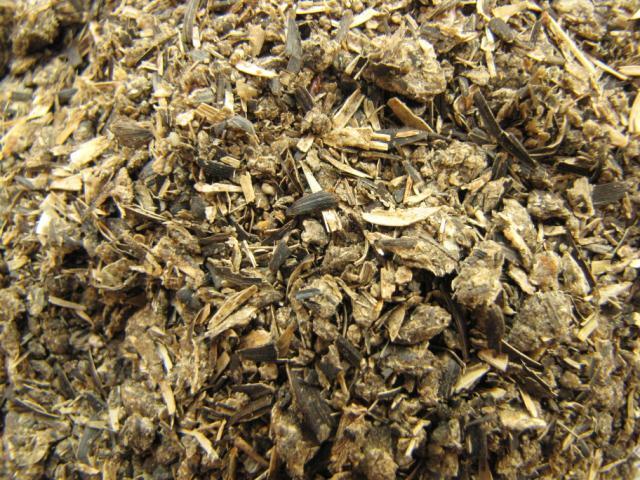 Though it contains less protein and much more fibre than soybean meal, sunflower meal is a valuable livestock feed, particularly for ruminants and rabbits, and under certain conditions for pigs and poultry. Sunflower meal is one of the major protein meals used for livestock feeding, particularly for ruminants. It is generally a valuable and safe product, whose protein, fibre and oil contents are highly variable and driven by variations of the oil extraction process. Its protein content ranges from 23% DM for some non-dehulled, mechanically-extracted meals, to more than 40% for highly decorticated, solvent-extracted meals. However, usual ranges for protein are 29-33% DM for non-dehulled meals and 35-39% DM for dehulled and partially dehulled meals. The fibre content is directly linked to the presence of hulls: crude fibre ranges from 27 to 31% DM for non-dehulled meals and from 20 to 26% for dehulled and partially dehulled sunflower meals. The lignin content is important, in the 9-12% range, even for dehulled meals. Solvent-extracted sunflower meals contain about 2-3% DM of residual oil, but mechanically-extracted meals may contain up to 30% oil depending on the amount of pressing. This oil content gives expeller meals a higher gross energy (22 MJ/kg DM or more vs. 19 MJ/kg DM for solvent-extracted meals), but these meals contain less protein than solvent-extracted ones. One particularly interesting trait of sunflower meal is the absence of intrinsic antinutritional factors: unlike other oil meals, including those of soybean, rapeseed or cotton, it does not require heating or special attention before being fed. Its amino acid profile is richer in sulfur-containing amino acids, particularly methionine, than other protein sources, but its lysine content is much lower than that of soybean meal (3.5 vs. 6.1% protein). Sunflower meal is considered to be lysine-deficient for several monogastric species (Poncet et al., 2003; Steen, 1989; Villamide et al., 1998; McNab, 2002). Sunflower meal is also a valuable source of calcium, phosphorus and B vitamins (Grompone, 2005). The high fibre and lignin content of sunflower meal tends to reduce nutrient digestibility, and its energy values are lower than those of soybean meal. It is suitable for ruminants and rabbits, but only for pigs and poultry with low energy requirements (animals at maintenance, laying hens) or specific fibre requirements (sows) (CETIOM, 2003). In other monogastrics, such as broilers or growing pigs, the cost-effectiveness of including sunflower meal depends on the quality of the meal and on the availability and price of better sources of protein and lysine. It must be reiterated that sunflower meal is a highly variable ingredient where protein, fibre and fat cover a much larger range than in many common feeds. When formulating diets with sunflower meal, one should always take into account the actual analytical composition of the batch used, rather than table values. It must be noted that, unfortunately, many trials involving sunflower meal fail to mention the processes involved (dehulling and extraction type). A major benefit of sunflower meal is that it does not have antinutritional factors such as those found in soybean, cottonseed and rapeseed meals. For that reason, it is considered to be a safe feed for all species, its only limitations being its fibre content and amino acid deficiencies. However, residues and contaminations from sunflower cultivation, harvest and post-harvest operations may be of concern. The use of fertilizers containing copper occasionally result in high copper levels in sunflower products. Sheep are more susceptible to chronic copper poisoning than other livestock. In south-eastern Spain, deaths have been reported in lambs that had consumed sunflower meal with moderate Cu content (up to 14 mg/kg), but with high copper:molybdenum ratio (over 6:10), making toxicosis very likely. Sunflower products should be fed to sheep in combination with sources of molybdenum, such as green forage, that may help to prevent excessive accumulation of Cu in the liver (Garcia-Fernandez et al., 1999). Sunflower meal may be contaminated during harvest and post-harvest operations: risk factors are pesticides residues, hexane residues, dioxin contamination resulting from the utilization of anticaking agents, mycotoxin development due to poor drying before storage and salmonella (FEDIOL, 2010). Chlorogenic acid, a phenolic compound present in sunflower meal, causes eggshell staining when eggs come in contact with sunflower meal dust. Feeding poultry with sunflower meal pellets and frequent egg collection alleviate this problem (Daghir, 2008). Sunflower meal has been used to feed ruminants for a long time and was appreciated in the 19th century as an excellent ingredient (Cornevin, 1892). Numerous experiments have since confirmed that, even in its non-dehulled form, sunflower meal can be used without problems as a protein supplement in ruminant diets. Sunflower meal can replace soybean meal (and other oil meals with a higher protein content, such as cottonseed meal or groundnut meal), provided that the diet is properly balanced for protein and fibre. Due to its high variability, users should allow for the precise protein, fibre and oil content of the sunflower meal used in the diet. In vivo OM digestibility of sunflower meal varies from 52 to 74% and is negatively correlated to fibre content: dehulled meals tend to be more digestible (about 66%) than non-dehulled meals (61%) (Economides, 1998; Irshaid et al., 2003; Molina Alcaide et al., 2003; Woods et al., 2003a; Arroyo et al., 2005; Beran et al., 2005; Mondal et al., 2008; Marcondes et al., 2009; Goes et al., 2010). ME values range from 8.6 to 11 MJ/kg DM. Sunflower meal protein is more degradable than that of other oil meals (Poncet et al., 2003). Values are usually in the 70-80% range though lower values as well as values over 90% have been reported (Sauvant et al., 2004; Domingues et al., 2010; Economides, 1998; Gonzalez et al., 1999; Molina Alcaide et al., 2003; Pop et al., 2006). In animals fed sunflower meal, rumen ammonia rapidly increases within 4 hours after feeding, which facilitates microbial synthesis and OM digestion (Shayo et al., 1997a). Heat treatment or toasting increases the proportion of rumen undegradable protein (Anderson, 2002). A treatment combining acid and heat reduced protein degradability from 80% to 34-38% (Arroyo et al., 2005). Fibrolytic enzymes may be used in the ration to break down sunflower fibres, releasing more energy and protein (Titi, 2003). Ibid. Ibid. Replaced 100% cottonseed meal 28% Decreased milk yield (7.4 vs. 7.8 kg/d) and increased fat content (6.31 vs. 6.20%) Ibid. 296 kg Replaced cottonseed meal in TMR 10.8% protein 5.5-11% No effect on diet digestibility and N retention Ibid. Ibid. Ibid. Ibid. but TMR 13% protein 22% Higher DM and protein digestibility Ibid. Ibid. Ibid. Replaced cottonseed meal in sorghum-based diet (8% protein) 5% No effect on ADG but higher wool growth (6.95 vs. 5.90 g/cm²) Ibid. In pig diets, the use of sunflower meal is limited by its high level of fibre and its deficiency in several amino acids including lysine, threonine and tryptophan. Sunflower meal has a much lower energy value than soybean meal: the net energy value for growing pigs of a dehulled, high-protein sunflower meal is about 64% of that of low-protein soybean meal (6 vs. 9.3 MJ/kg DM respectively). The total energy range for sunflower meal is very wide: in a experiment comparing various levels of dehulling, NE estimates went from 5.4 to 7.9 MJ/kg DM for normal processes, and experimental products went from 3.5 to 9.0 MJ/k DM (Perez et al., 1986). Opinions differ on whether sunflower meal should be used or not for growing pigs. Some authors state that it should be completely avoided for all classes of growing pigs (CETIOM, 2003). Others recommend that while starter pigs should not receive sunflower meal, it can be fed up to 25-33% of the protein source to older animals (Blair, 2007; Chiba, 2001). Sunflower meal, unless it is of exceptional quality, is certainly not very suitable for growing animals with high energy and protein requirements. Sunflower meal used as soybean meal replacer in piglets and growing pigs diet resulted in lower feed intake, lower growth performance and lower carcass quality when the level of sunflower meal in the diet was above 10-11% (Lipinski et al., 2002; Shelton et al., 2001; Li DeFa et al., 2000; Cuca et al., 1974). Sunflower meal also resulted in lower feed efficiency than soybean meal (Shelton et al., 2001). Different studies showed that this problem could be alleviated, but not totally eliminated, by lysine and oil supplementation (Shelton et al., 2001; Cortamira et al., 2000; Wetscherek et al., 1993; Aherne et al., 1985), even when high-quality sunflower meal (twice-decorticated) was used (Cortamira et al., 2000). Sunflower meal used as the only protein source and supplemented with lysine yielded inconsistent growth performance, sometimes resulting in higher growth rate, sometimes in similar or lower ones (Akdag et al., 2008; Shelton et al., 2001; Wahlstrom, 1985). However, the utilization of sunflower meal for growing pigs will depend on its cost-effectiveness and local conditions. For example, in Turkey, sunflower meal supplemented with lysine gave similar results to soybean meal and successfully replaced kitchen wastes in piglet diets, resulting in better animal performance and feed efficiency (Akdag et al., 2008). Sunflower meal can be used at higher rates in diets for finishing and adult pigs (Blair, 2007; Chiba, 2001). In finishing pigs, inclusion rates up to 16-21% did not hamper growth performance and carcass quality (Carellos et al., 2005; Silva et al., 2002). Male animals had better growth performance than females when offered sunflower meal (Silva et al., 2002). However, higher inclusion levels may also result in lower performance and meat quality (soft backfat with higher linoleic acids) (Blair, 2007). Sows and adult boars have lower lysine requirements and sunflower meal can be used as the sole protein source, provided that the total diet provides the required amount of digestible lysine. Sunflower meal did not impair reproductive performance of sows (Kleisiari, 2005). It was recommended for feeding to lactating sows provided that they were given a protein source rich in lysine (Blair, 2007). In poultry feeding, sunflower meal is considered as a protein-rich but lysine-deficient and high-fibre ingredient, whose fibre fraction is mainly composed of insoluble sugars, resulting in low ME values that depend on the actual fibre content (Villamide et al., 1998). As a consequence, sunflower meal is a more suitable ingredient for laying hens than for birds with higher protein and energy requirements, such as broilers and turkeys (CETIOM, 2003). It may also be cost-effective to use sunflower meal for poultry diets in countries where soybean meal is not available or too expensive (Senkoylu et al., 1999). Dehulled sunflower meals have higher ME values than non-dehulled meals, as they contain more protein and less fibre. Mechanically-extracted sunflower meal has a higher ME value due to its larger oil content, but it is less valuable as a protein source due to its lower protein. Processing may have complex effects, positive and negative, on the nutritional value of sunflower meal (San Juan et al., 2000; Zhang et al., 1994). While lysine content is low, its digestibility is good. The addition of crystalline lysine may be economically profitable, but eventually depends on the price of lysine at any given time. The use of exogenous enzymes for alleviating the negative effects of sunflower fibre has been intensively tested but without consistent results (Attia et al., 2003; Mushtaq et al., 2006). 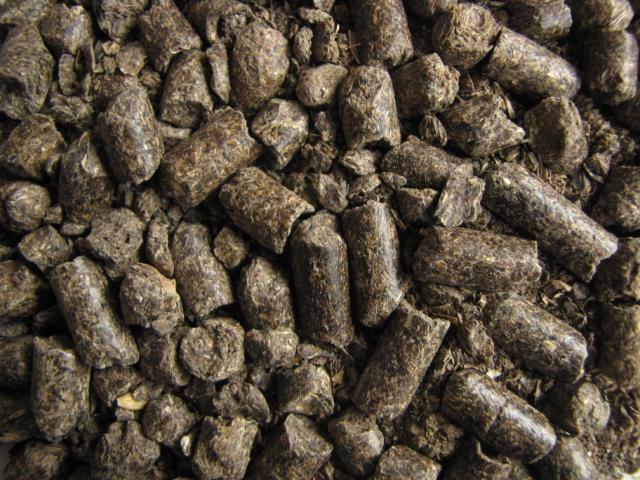 Poultry feed formulators limit the use of high-fibre ingredients by adding the maximum level of crude fibre as a constraint. When this constraint is removed and when adequate levels of lysine and other amino acids are supplied in broiler diets, inclusion rates of sunflower meal can reach up to 30% without detrimental effects on performance (Mushtaq et al., 2009; Rao et al., 2006; Senkoylu et al., 2006). Diets containing large amounts of sunflower meal, including high-oil meal, tend to be bulky, resulting in lower feed consumption. Reducing bulkiness by pelleting increases feed intake and performance (gain and feed conversion ratio) (Senkoylu et al., 2006). In layer diets, it is possible to introduce up to 30% sunflower meal without affecting performance (Deaton et al., 1979). In other bird species, pelleting may also improve feed efficiency by decreasing the bulkiness of sunflower meal-based diets, for example in diets for waterfowl (Vetesi et al., 1998). In turkey diets, the inclusion rate of sunflower meal seems to be more limited (less than 14%), as turkeys have higher requirements for protein and amino acids, and because sunflower meal may induce undesirable effects (decrease in the mass of small intestine and caecal tissues, and inhibition of the fermentation processes in the caeca) (Juskiewicz et al., 2010). In rabbit feeding, sunflower meal is a dual purpose raw material, being both a source of (more or less) balanced protein and a source of lignin-rich fibre. It is an ingredient suitable for rabbit feeding without technical restriction provided that protein level, protein quality and fibre composition are taken into account in diet formulation. Sunflower meal only supplies about 70% of the lysine requirements for growing and breeding rabbits, but exceeds the requirements for sulfur-containing amino acids, threonine and tryptophan (Lebas, 2004). Due to its lysine deficiency, sunflower meal is frequently used together with soybean meal or legume grains (Carabaño et al., 1992). Lignin content is very high, even in dehulled sunflower meal, and for that reason sunflower meal can be considered as a "safety" ingredient for maintaining digestive health in growing rabbits (Gidenne et al., 2010). Sunflower was used in 33 out of 58 experimental diets described in the papers published at the 9th World Rabbit Congress in 2008, with an average inclusion rate of 12% (Lebas et al., 2009). However, many feeding studies in growing rabbits mention much higher acceptable inclusion rates, usually 20-25% (Martina, 1976; Aduku et al., 1988; Bhatt et al., 1999; Ismail et al., 1999; Kpodekon et al., 2009). In some experiments sunflower meal was incorporated at 38% or even 45% of the diet (Siddaramanna et al., 2009; Masoero et al., 1990). Because it is considered as a safe ingredient, sunflower meal is often included at 12-20% in the control diet in studies that test alternative ingredients or investigate the effects of fibre in rabbit nutrition (Lebas et al., 1977; Villena et al., 2008; Volek et al., 2008; Molette et al., 2009). Studies on rabbit reproduction often include sunflower meal at 12-16% in the control diet (Lebas, 1978; Lebas et al., 1996; de Blas et al., 1995; Alvarez et al., 2007). Sunflower meal is a valuable source of protein for fish species, particularly in its dehulled form. It is often used to replace soybean meal since it is free of trypsin inhibitors and has a higher vitamin content than soybean meal (Hertrampf et al., 2000). Sunflower meal can be a cost-effective alternative to fish meal in tilapia, as shown by several experiments. Sunflower meal replaced 10 to 25% fish meal in the diets of Nile tilapia (Oreochromis niloticus) (hulled meal; El-Saidy et al., 2002), and redbreast tilapia fingerlings (Tilapia rendalli) (Olvera-Novoa et al., 2002). In the latter study, the most cost-effective diet included 20% sunflower meal (Olvera-Novoa et al., 2002). L-methionine and lysine supplementation have been suggested to obtain optimal results (El-Saidy et al., 2002). A blend of sunflower meal, cottonseed meal, linseed meal and soybean meal (1:1:1:1) totally replaced fish meal and gave a better economic return without detrimental effect on animal performance and feed efficiency (El-Saidy et al., 2003). It was also shown that decorticated sunflower meal could replace a high proportion of fish meal provided that tilapia received adequate energy supplementation (Maina et al., 2002). Feeding tilapia sunflower meal increased the content in linoleic acid (18:2 ω6) in the fish, but resulted in low levels of desirable eicosapentaenoic acid (20:5 ω3) and docosahexaenoic acid (22:6 ω3) (Maina et al., 2003). In a comparison between sunflower meal, maize gluten meal and wheat bran in diets for Indian carp fingerlings fed each ingredient at 4% (wet fish weight twice a day), sunflower meal gave the highest average body weight (Shabir et al., 2003). There have been many studies aiming at determining the possible replacement of fish meal or soybean meal in rainbow trout diets. Early trials found that increasing sunflower meal from 0% to 36.5% resulted in lower DM intake and lower performance (Tacon et al., 1984 cited by Hertrampf et al., 2000). However, later works reported inclusion rates up to 40% without deleterious effects on performance (growth, feed intake, feed efficiency and survival) (Gill et al., 2006). An experimental high-protein (41% DM) and extruded sunflower meal replaced about 33% of the protein provided by fish meal in the diet of post-smolt salmons, without any adverse effects on their performance (Gill et al., 2006). When sunflower meal replaced up to 50% fish meal in eel diets it decreased intake and growth performance, unless supplemented with essential amino acids (Higuera et al., 1999; Garcia Gallego et al., 1998). Juveniles of gilt-head bream were fed up to 36% undecorticated sunflower meal. However, animal performance and feed efficiency were higher at 10-12% sunflower meal inclusion and the best economic return was obtained at 14% (Sanchez Lozano et al., 2007). Sunflower meal could be included at 20-30% of the diet for abalones. However, its apparent protein digestibility was lower than that of soybean meal (92 vs. 96%) (Sales et al., 2002; Sales et al., 2003). The inclusion of 30% sunflower meal had no effect on growth performance (Shipton et al., 2001). Chiba, L. I., 2001. Proteins supplements. In: A. J. Lewis and L. L. Southern (eds.) Swine nutrition (second edition). p 35. CRC Press LLC, Boca Raton London New York Washington, D.C.
Deaton, J. W. ; Mc Naughton, J. L. ; Burdick, D., 1979. High fibre sunflower meal as a replacement for soyabean meal in layer diets. Br. Poult. Sci., 20:159-162. Mushtaq, T. ; Sarwar, M. ; Ahmad, G. ; Nisa, M. U. ; Jamil A., 2006. The Influence of exogenous multienzyme preparation and graded levels of digestible lysine in sunflower meal-based diets on the performance of young broiler chicks two weeks posthatching. Poult. Sci., 85: 2180-2185.